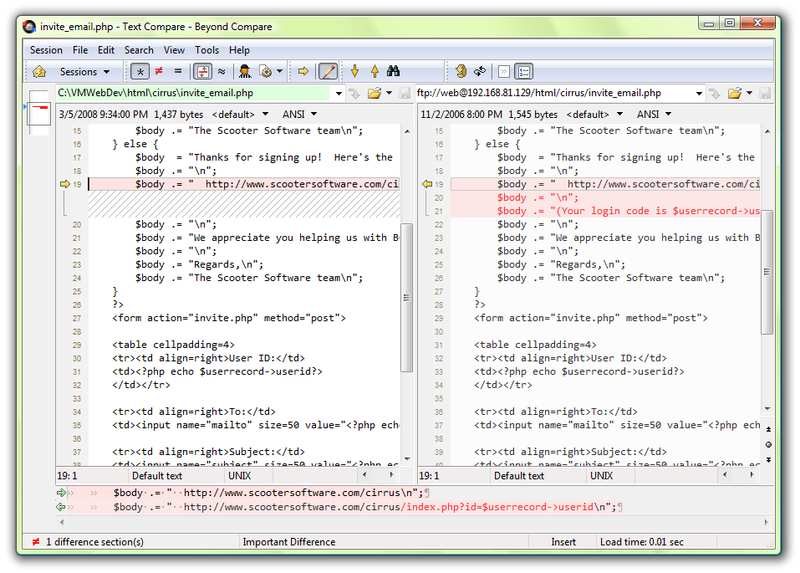 Beyond Compare is a directory and file compare utility. Synchronize files between laptop and PC, home and office, etc. Compare directory trees side-by-side with mismatches highlighted. Display text files side-by-side with changes highlighted. Great for merging changes to source code. Handles minor editing, Unicode files, Delphi form files. Save favorite sessions for quick access. Built-in FTP and zip support.organized in folders.And much more. ...... FTP sites and zip files are integrated seamlessly, so you can update your website with the touch of a button. Here are some of the significant new features in Beyond Compare 3. Items flagged with are available in the Pro edition of BC3. Can compares the contents of two folders, compare Zip, Tar, GZip archive files. Qweas is providing links to Beyond Compare 3.3.5 as a courtesy, and makes no representations regarding Beyond Compare or any other applications or any information related thereto. Any questions, complaints or claims regarding this application Beyond Compare 3.3.5 must be directed to the appropriate software vendor. You may click the publisher link of Beyond Compare on the top of this page to get more details about the vendor.